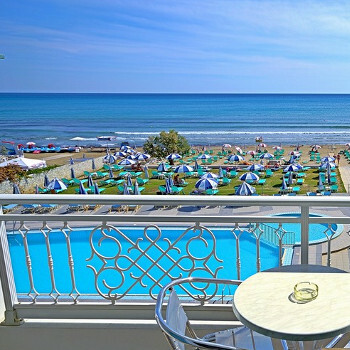 Perfect for families, couples and small groups of friends who want to be within easy walking distance of the resort, this modern hotel provides extremely comfortable accommodation and enjoys a great central location, overlooking the shelving sands of Laganas. The hotel is in a perfect location..right on the beach. The food was dreadfull. Breakfast was fried egg and sausage one day, and the next scrambled egg with streaky bacon. Facilities for children were non existant bar for the small paddling pool. The resort itself was very nice with an abudance of friendliness shown to tourists and whilst I would recommend the resort I can not recommend the hotel. It is certainly not worth the 4 stars.